Dr. Sunu Wibirama received Yarsi Researcher Award 2017 on April 27th, 2017. The award was given by Vice President of Republic of Indonesia, Bapak H.M. Jusuf Kalla in The 12th Floor of Ar Rahman Auditorium, Universitas Yarsi, Jakarta, Indonesia. Yarsi Researcher Award 2017 was held in the commemoration of the 50th Anniversary of Universitas Yarsi. The award was presented to Indonesian scientists in Life Science, Information Technology, and Social & Cultural fields. 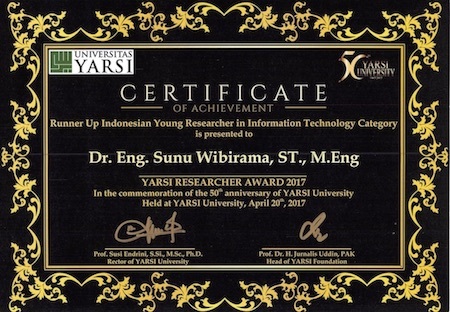 Dr. Sunu received Runner Up in Indonesian Young Researcher with Information Technology category. The award was given in regards with research achievement of Dr. Sunu Wibirama. The committee conducted administrative selection during February to March 2017. All participants were asked to submit curriculum vitae, executive summary of their research, and research poster in English. The award was given by considering sustainable research road map, originality of the research, research outcome and product, research publications, intellectual property, potential impact of the research, and oral presentation. Dr Sunu proposed his recent work on eye tracking application to investigate vertigo disease as a research portfolio to be awarded by Universitas Yarsi. On April 20th, 2017, Dr. Sunu presented his research portfolio in front of three professors in Universitas Yarsi, Indonesia. The presented research portfolio was regarded as valuable invention to help young medical doctors to analyze vertigo disease by recording and analyzing eye movements. Additionally, the judges considered the presented research to be a unique research as this research is the one and only to be conducted in Indonesia, hence supporting future plan of Indonesian government on national development of information technology for public health.